Do you find yourself sneezing at a particular time of year? Does a particular material cause you to have a reaction when it comes in contact with your skin? Did you know that your dog can suffer from the same types of symptoms? When you have an allergic reaction to something, the reason is that your immune system has overreacted to some sort of material or substance. The immune system will respond to the substance by increasing the number of white blood cells, hormones and histamines in the bloodstream. For people, this can mean itchy, watery eyes and sneezing, and the same is true for your pet. 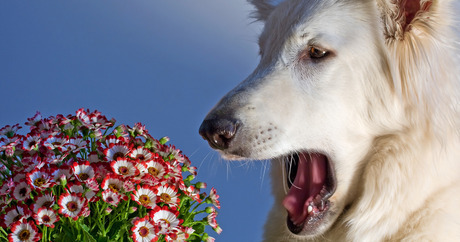 Allergies are a common problem in dogs, and can occur from exposure to pollen, dust, a household product, a food ingredient or an insect bite. When your dog suffers from an allergic reaction, his symptoms can include pruritis, which is itchy or swollen skin, vomiting, diarrhea, and even difficulty breathing. If your pet is suffering from some type of allergy, chances are good that he is a pretty unhappy puppy; and just like with people allergies, canine allergies do not have a cure. Fortunately, there are a number of things that you can do to limit your pet’s exposure to his allergens and make him feel more comfortable when allergy symptoms do strike. First, it is important to understand the four basic types of allergies in dogs. While contact allergies are fairly common in humans, this is the rarest type of allergy in dogs. It occurs when your dog comes in direct contact with his allergen, such as when he lies in a wool blanket or has a reaction to a chemical in his flea collar. If you suspect that your pet has a contact allergy, you can usually solve the problem easily by preventing contact with the identified substance. It is usually fairly easy to determine which substance is giving him the problem by having your pet touch a variety of surfaces and watching for a reaction. If you suspect that your dog is allergic to something in his food, it may take more time and effort on your part to determine what the guilty ingredient is. Keep in mind that most dogs are not born with a food allergy, but develop it over time–usually to an animal protein of some sort. Your dog may show signs of a food allergy through digestive disorders, itching, or respiratory problems. If you have decided that a food allergy is causing the problem with your pet, you need to know that the allergic effects of food can remain in your dog’s system for as long as eight weeks. This means that every time you introduce a new food, you will need to wait eight to twelve weeks before knowing for sure how your dog will respond to it. You will also need to make sure that your dog doesn’t eat anything else during the testing process, including table scraps and treats. Switching diets to see if your pet tolerates a different type of food better is a long and complex process, but well worth the effort if you can “cure” your pet’s allergies simply by removing a food substance from his diet. When most of us think of inhalant allergies, hay fever is the first thing that comes to mind. Pets can suffer from hay fever symptoms just like humans can, and the symptoms will generally rear their ugly heads in the transitional times of year like spring and fall. While your dog might be allergic to outdoor substances like pollen and mold, indoor culprits such as mildew, mold and dust mites can make allergies more of a year-round problem. You will usually see symptoms of inhalant allergies in the form of itching of the feet, ears, armpits, and groin area. This itching can become so constant that your dog will develop hairless “hot spots” from scratching and chewing on the affected areas. If your pet’s allergies are indeed seasonal, you can do much to relieve his symptoms by simply limiting exposure to the allergens during this time of year. For example, limiting outdoor time will go far in reducing allergy symptoms to outside allergens. However, if your dog is allergic to something inside your home, the problem may become more chronic in nature. In this case, there is very little that you can do to limit your pet’s exposure to his allergens, short of buying an air filter for his indoor environment. Probably the most common type of allergy in dogs is the flea allergy. If your dog is allergic to fleas, it’s the proteins in flea saliva causing the reaction in your pet. One bite from one flea can cause a severe itch that might last as long as five days if your pet is particularly susceptible. If you think your dog is allergic to fleas, your best offense is a good defense: prevention is the key. Bathe your pet frequently, and use flea medications to ward the little critters off. Your veterinarian can help you find the safest and most effective flea treatment for your dog. It’s important to treat objects that your pet comes in contact with, like his bed, as well as his environment to keep fleas at bay. Sometimes allergies can be quite challenging to deal with, whether determining the cause of the allergy or creating a clean and allergen-free environment for your pet. This is why it is so important to partner with your veterinarian in diagnosing and treating your dog’s allergies. There are a number of possibilities that you and your vet can explore to make life more comfortable for your pet. Allergy tests can be done by your veterinarian, and may include scratch tests that are similar to those done on humans. With this type of testing, small amounts of the suspected allergen are inserted into your dog’s skin to see if a reaction occurs. Your veterinarian can also use blood tests to discover the source of the allergy, by monitoring the function of the immune test when exposure takes place. Sometimes these various tests can be quite effective at determining the cause of your dog’s allergy. Steroids can help treat allergies by suppressing the immune system to reduce the severity of the reaction. While this can be an effective treatment in symptom reduction, and can be used when an allergen cannot be identified, there are side effects to steroid use. These side effects can include thirst, increased urination, weight gain and behavioral changes. Because of this, it is generally best to use steroids to treat seasonal rather than year-round allergies, so that exposure to the medication is limited. Immunotherapy is an effective way to treat allergies in people, and it can be equally effective in dogs. With this type of treatment, small amounts of the allergen are injected weekly to act as a sort of vaccination against the reaction. The immune system will become desensitized to the allergen, until it does not react to the substance as strongly. Keep in mind that immunotherapy, while effective, can take six to twelve months to show positive results. Antihistamines work on dogs the same way they do in people – by blocking the histamines that are produced by the immune system, and consequently reducing symptoms like itching and inflammation. While these medications are considered safe to use, they can make your pet drowsy and sluggish. Prolonged use of antihistamines can actually affect your dog’s quality of life for just this reason. Symptomatic treatments are the remedy of choice when all other options have been exhausted to no avail. This means you simply bring relief to your pet’s symptoms as they arise, through shampoos, ear treatments or ointments and sprays. Look for products that have soothing ingredients like oatmeal or Epsom salts for maximum benefit. Before using any type of treatment on your dog, it is a good idea to consult with your veterinarian to ensure that the treatment will indeed be safe and effective. Keep in mind that even though symptomatic treatments can be effective, they are only a temporary solution. For long-term treatment options, you will need to talk to your veterinarian. Treating your dog’s allergies may require plenty of time and effort on your part, but your dog’s health is well worth it. A symptom free pet will be a happier and friendlier companion for you and your family.